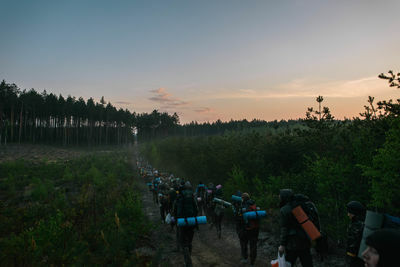 Every year since 2004, over 300 young men and women aged between 17 and 28 years old from the Young Nationalist Congress (MNK), an organization promotes Ukrainian nationalism, fight in extreme conditions for 60 hours in the middle of a western Ukrainian forest, between the villages of Gurba and Antonivtsi. The game takes place where the Ukrainian Revolutionary Army (UPA) fought the Red Army in 1944. The rules derive from Zarnitsa (Summer Lightning), a game commonly played during Soviet times by the Young Pioneers (a Soviet organization similar to Scouts). Two teams have to defeat each other by capturing the other team's flag. Despite the intensity of the fight, injuries are minor. Punches and weapons are forbidden. A referee makes sure that no rules are broken and collects the colored ribbons, which are velcroed on the players’ arms and symbolize their “life”. 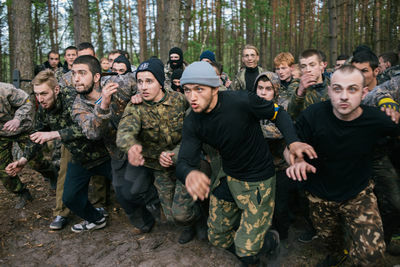 According to its website (http://gurby.org.ua), the game aims at training and preparing the youth in case of military intervention by Ukraine’s Eastern neighbors. This year’s event was tainted by the Ukrainian revolution. Many of the players have been protesting in Maidan Square for months. 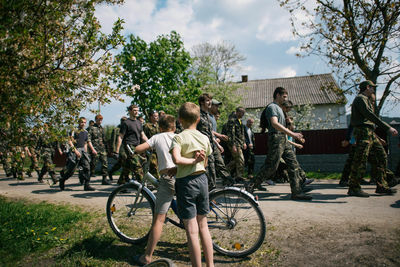 Players walking through the territories where the Ukrainian Insurgent Army survived a battle against the Red Army in 1944. A player treats a blister. The Lions (left) and Wolves (right) fighting. 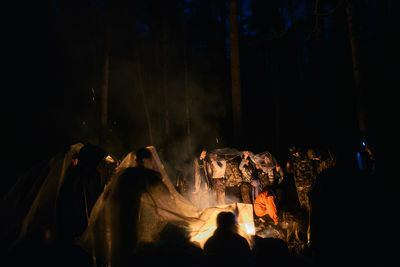 Players spending the night around the fire. Fire are usually not lighted because they can reveal the team's position to the enemy. However, that night, the players were forced to light a fire because they were caught by the rain and had no tent to protect themselves. Players getting ready for the night. Some paint their face black to be less visible. No light is used at night to prevent being spotted by the saboteurs team. 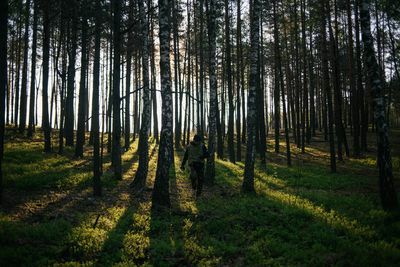 Attacks from a third team called the "saboteurs", makes it almost impossible to sleep at night. Every quiet moment during day is therefore used by the players to sleep. A player comes back from scouting. The game is played on a 25 square kilometer area. Players of the Lions try to immobilize a member of the Wolves team to get his arm band which symbolizes his life. When his life is taken, the player has to walk back to the organizers' headquarter located a few kilometers away to get a "new life". Two kids observe the paticipants of the Gurba-Antonivtsi game walking toward to cemetery to pay respect to Olexandr Kapinos, a former member of the Svoboda party, who lost is life at the age of 29 during the clashes in February in Kiev. Dunaiv, Ternopil region. 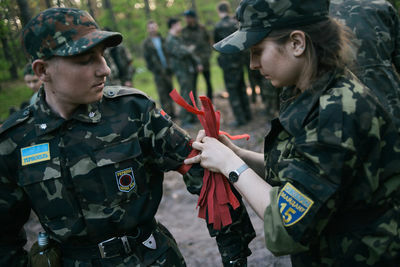 A girl wearing the logo of the 15th self-defense unit of Maidan places the red velcro ribbon on the arm of a participant. The ribbon symbolized the player's life. The game is composed of three teams: The Wolves, wearing red ribbons, The Lions wearing yellow and the "Saboteurs", wearing black. 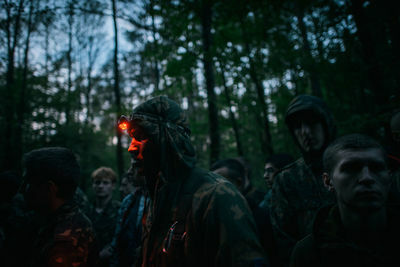 The yellow and red teams (150 players each) compete against each other, while the "Saboteurs" team (30 players) acts as a independent group whose function is to put stress on the teams by attacking them at night using guerrilla tactics. 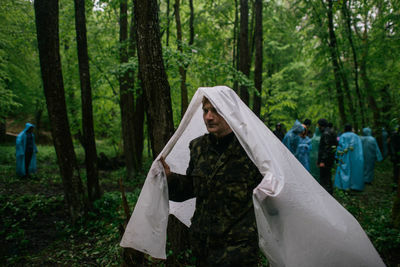 A player dressed with plastic coats after the rain. The Lions won after they managed to defend their flag. Players of the Lions team wait while scouts are sent to explore the neighboring areas. 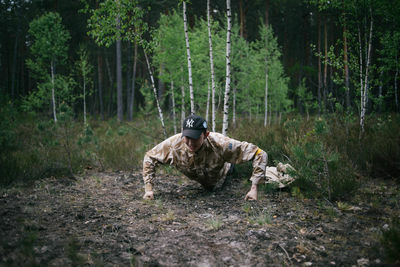 A player doing push-ups. The players are regimented and every infraction, like being late for a muster, is punished with push-ups. Participants of the Gurba-Antonivtsi game at the cemetery of Dunaiv (Ternopil region) to pay respect to Olexandr Kapinos, former member of the Svoboda party, who lost is life at the age of 29 during the clashes in February in Kiev. 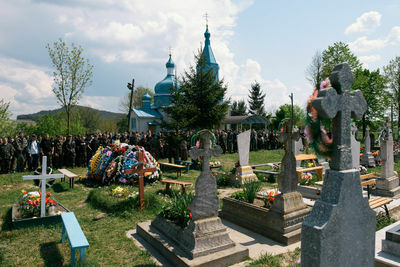 The 340 participants take seats for the commemoration of the battle between the Ukrainian Revolutionary Army (UPA) and the Red Army which took place between the villages of Gurba and Antonivtsi in 1994. 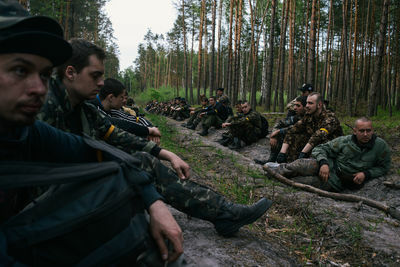 The Ukrainian Revolutionary Army (UPA), with its 5000 soldiers, managed to resist and escape after being encircled by a largely superior Red Army. Players sleep during the game. Players are exhausted because the saboteurs team normally keep them awake at night. Therefore, every quiet moment is used to sleep. Players training on how to scare their opponents and being more effective while fighting. Players of the yellow team build a barricade "like in Maidan" to defend their flag. Smoke bombs are usually used during the fights. 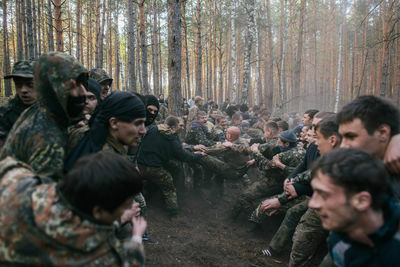 The Wolves getting ready for the fight, which consists of stripping the arm ribbon off opponents' arms. Punches are not allowed, only catches are. Girls during a short break. A couple tries to rest during the game. Lions training to improve their technique of attack. 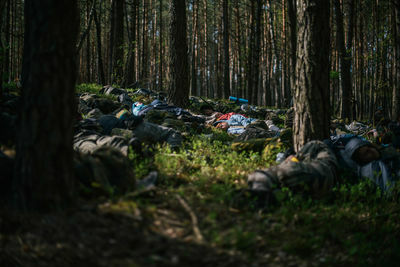 Players crawling to avoid being seen while scouting to find the enemy flag. Two teams, the Lions and the Wolves fighting. Punches are not allowed. Only catches are.